Whey Protein Concentrate, Natural Flavors, Inulin, Cane Sugar, Xanthan Gum, Sunflower Lecithin, Salt, Monk Fruit Extract, Rebaudioside A (Stevia Leaf Extract). $29.49 per canister - SAVE $5.00! $24.99 per canister - SAVE $28.00! 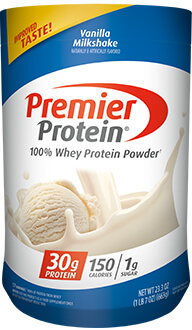 Each serving contains 30g protein* with all the essential amino acids, 180 Calories, and 3g Sugar. *100% of protein from whey. Available in two delicious flavors: Chocolate Milkshake, Vanilla Milkshake. Try it mixed with water or milk, blended into your favorite smoothie recipe, or baked into protein packed recipes.